Doug Douglas presented Jackie Stewart with a Z-Medica Hemorrhage Control Training Kit to be used at PVH. Doug Douglas explained the proper way to apply a tourniquet and then had the class practice applying tourniquets themselves. Representatives from Mason County Schools, nursing staff members, PVH Trauma Center nursing staff, Mason County 911, and Mason County EMS were all in attendance to learn how to “stop the bleed” in emergency situations. 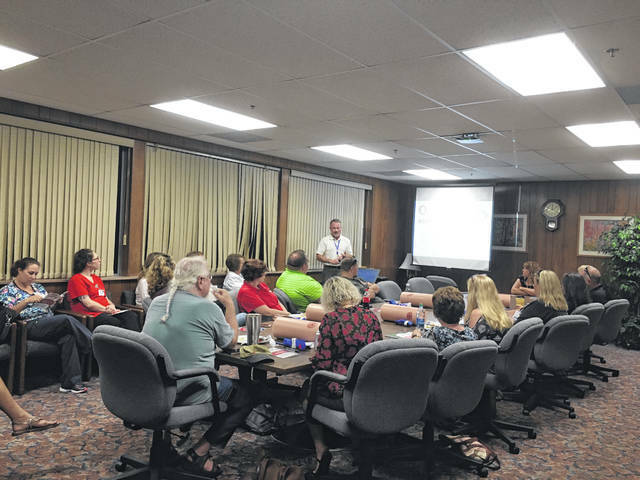 POINT PLEASANT — Pleasant Valley Hospital (PVH) hosted an informational session Tuesday on how to “stop the bleed” during emergency situations. The 20 individuals in attendance were representatives from Mason County Schools, nursing staff members, PVH Trauma Center nursing staff, Mason County 911, and Mason County EMS. Doug Douglas, registered nurse/certified flight nurse/trauma nurse clinician, lead the session. Douglas explained the “Stop the Bleed” campaign started after the Sandy Hook shooting. He explained “Stop the Bleed” is a national campaign designed to educate, prepare, and train bystanders as well as provide those bystanders with the tools and knowledge to stop life threatening bleeding in emergency situations. Douglas commented three to five minutes can mean the difference between life and death, 35 percent of pre-hospital deaths are from serious bleeding cases. He said the state of West Virginia is focusing on training and educating teachers, school nurses, principals, law enforcement, and civic groups as well as placing at least one personal bleeding control kit within the schools. Douglas said when an emergency situation occurs an individual needs to alert emergency personnel about the situation. Following, if a victim needs treatment, the individual needs to find the source of bleeding. Once found, the individual needs to open or remove the clothing over the wound, so it is clearly visible and then identify whether or not the bleeding is life-threatening. Life-threatening bleeding is blood that is spurting out the wound, blood that will not stop coming out of the wound, or blood that is pooling onto the ground. Also, clothing will be soaked with blood as well as bandages. Life-threatening bleeding may cause a victim to be confused or unconscious. The wound will then need to be compressed. If individuals have access to a trauma first aid kit, they can apply a tourniquet to the wound, however, if no tourniquet is available, they can pack the wound with gauze or a clean cloth. Also, a tourniquet should only be removed by a paramedic or a physician. If individuals do not have access to a trauma first aid kit, they will need to cover the wound with a clean cloth and apply pressure by pushing directly on the wound with both hands. Douglas commented once pressure is applied to a serious wound, the pressure should not be released. Douglas explained the proper way to apply a tourniquet and then had the class practice applying tourniquets themselves. He also demonstrated how to effectively compress the wounds when there is no access to a tourniquet. Douglas explained “Stop the Bleed” personal bleeding control kits are available for purchase and suggested purchasing the kits via the School Health Corporation website. 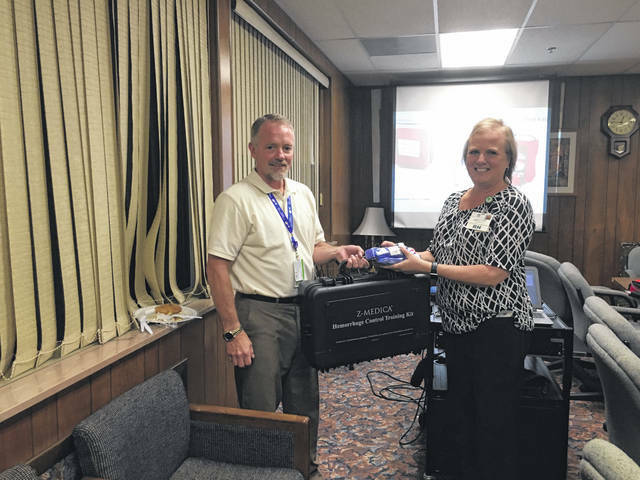 Also, after his presentation, Douglas presented the PVH staff with a Z-Medica Hemorrhage Control Training Kit. The PVH Foundation is currently seeking donors throughout the community to aid with the purchase of “Stop the Bleed” kits for all Mason County schools. For those interested in donating, contact either Jackie Stewart or Tracy Call (304) 675-4540, extension 1492.
https://www.mydailysentinel.com/wp-content/uploads/sites/14/2018/07/web1_0718-1-.jpgDoug Douglas presented Jackie Stewart with a Z-Medica Hemorrhage Control Training Kit to be used at PVH. https://www.mydailysentinel.com/wp-content/uploads/sites/14/2018/07/web1_0718-2-.jpgDoug Douglas explained the proper way to apply a tourniquet and then had the class practice applying tourniquets themselves. 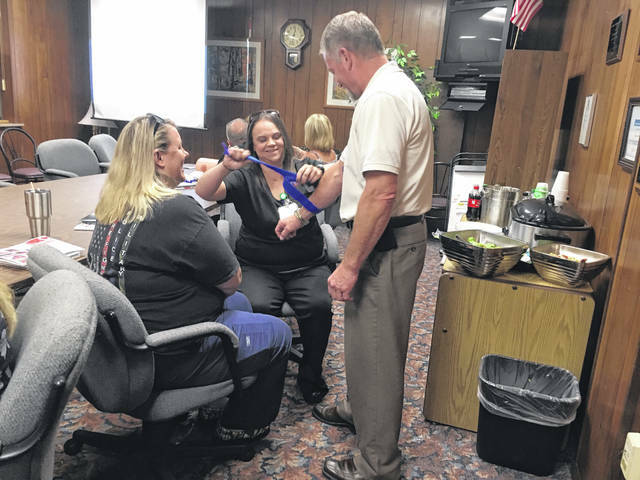 https://www.mydailysentinel.com/wp-content/uploads/sites/14/2018/07/web1_0718.PVH3_.jpgRepresentatives from Mason County Schools, nursing staff members, PVH Trauma Center nursing staff, Mason County 911, and Mason County EMS were all in attendance to learn how to “stop the bleed” in emergency situations.